Hungarian Goulash and Homemade Spaetzle – it was delicious thanks to Wolfgang’s inspiration and Merisi’s input all the way from Vienna! 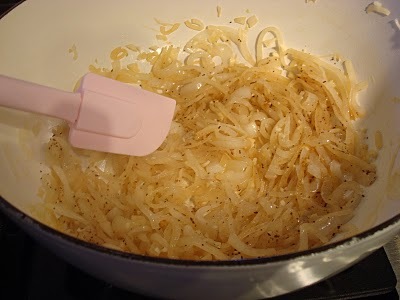 Start by caramelizing the onions in olive oil, then add garlic. 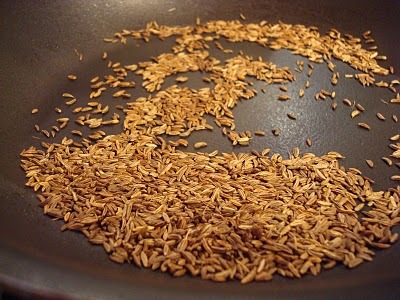 Toast the caraway seeds then grind them in a spice grinder and add to the onions. Smokey! Add the two paprikas…sweet and hot. I took Merisi’s advice not to make a “California Goulash” as she says there are no fresh herbs in her experience…so I added only dried marjoram. 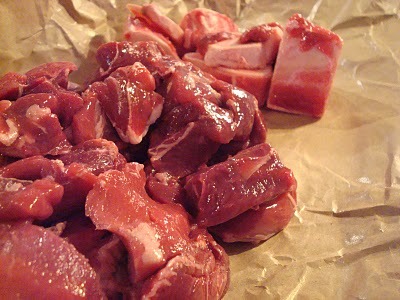 Andrew, the butcher at Bristol Farms cut the beef shanks into cubes and advised me to put the bones in the stew for more flavor. 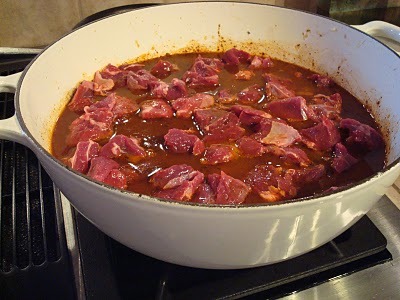 Deglaze the pot with balsamic vinegar then add the chicken stock, bay leaves and tomato paste, and the meat and bones. 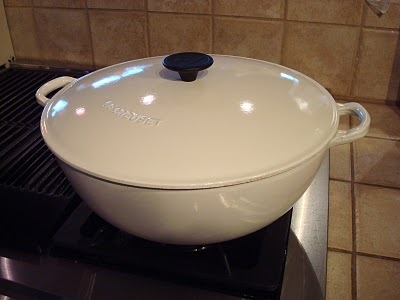 This Le Creuset French Oven is perfect for this dish. 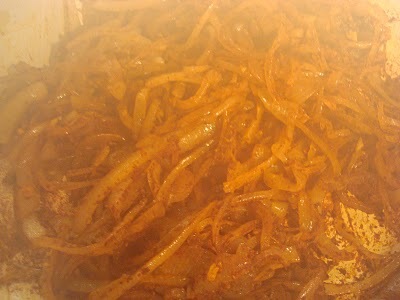 Merisi’s advice was to put it in the oven at 195 degrees not to let it boil and cook even longer than the original recipe for a very tender meat. Side Bar – The cook’s treat. 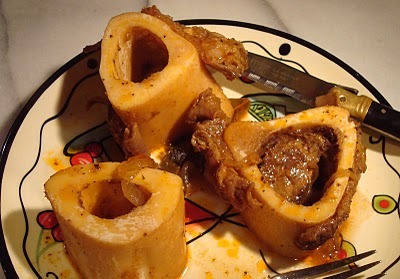 Remove the bones from the stew. Marrow anyone? The goulash is served in Pat’s beautiful China “Evesham” made in England. 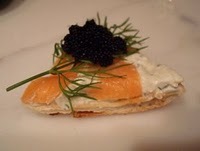 Sally kicked off the dinner party with a pizzette appetizer, her interpretation of Wolfgang’s famous pizza from Spago with smoked salmon and caviar. 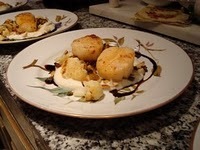 Pat’s scallop dish: Scallops, Cauliflower Cream, Balsamic Reduction. See 10/09 post for details. 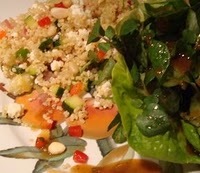 One course, two salads: Lauren made Wolfgang’s couscous salad while Gail prepared sliced roasted beets and mache in a butter lettuce cup with Wolfgang’s mustard dressing. 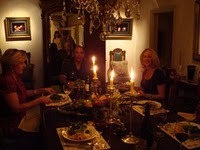 Elegant dinner party with friends who love to cook! 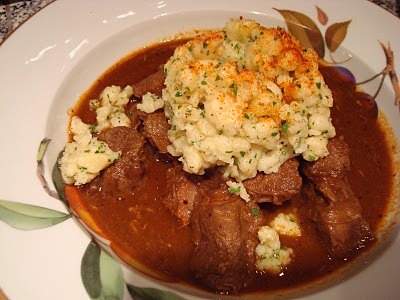 The Hungarian Goulash with Spaetzle. We are having an Austrian inspired dinner party in Southern California and I get excellent authentic advice and support from a woman in Vienna whom I have never met. Isn’t that something? Thanks Merisi! P.S. That said, you may want to visit the Foodie Blogroll, of which I am a proud new member. 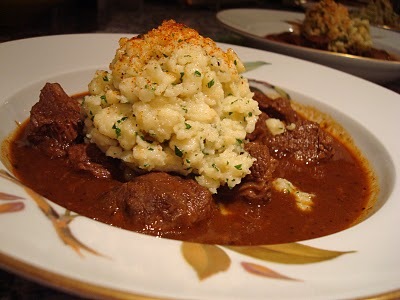 I love Goulash but have not had it in such a long time Yum! Everything looks delicious. How lucky you are to have friends like this.Must have been a fun and satisfying night. What a treat and feast and you are so right, this food-blogging thingy is fantastic. Thanks for your visit Lori Lynn(what a nice name! 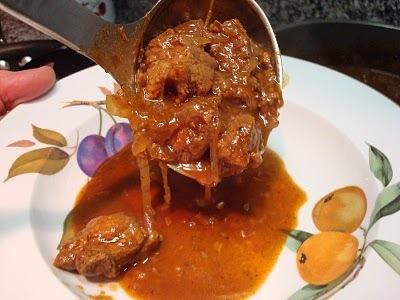 ), that way leading me to this post – I adore goulash and not a winter passes that I don’t try a new version, so of course I have yours in hand now and will have to make it. It looks delicious. 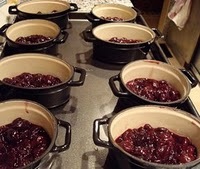 Hi Maryann – I am very fortunate to have such good friends, and that they can cook, what a bonus! We just love our themed dinner parties! Hi Cynthia – YAY for the food blogs! It’s nice to get to know another food blogger. Thanks for stopping by. Sorry it took me so long to swing by your beautiful blog. Thank you for mentioning me, it was a pleasure passing on to you what I know about Austrian food. Every dish of your meal looks delicious! Make me hungry right now. 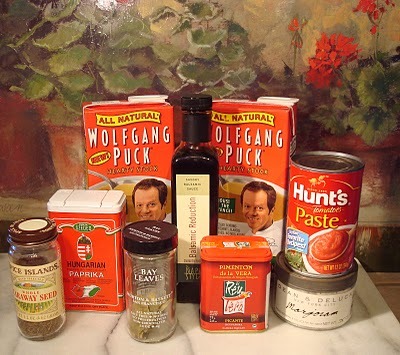 That Szeged Paprika is of excellent quality, I used it myself in the States. 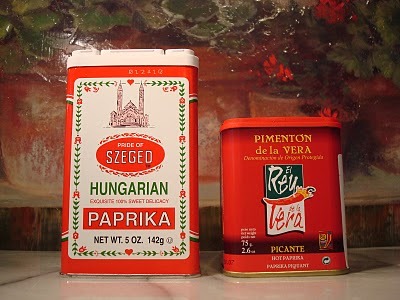 A couple of weeks I was in Hungary and bought paprika there (only an hour’s drive from Vienna, seems really strange). Regarding the Salzburger Nockerl, last time I was in Bad Ischl, a small town in the mountains not far from Salzburg, a visited my favorite cafe’ and pastry shop, the “Zauner”. On the table next to us a group of American students were eating these nockerl. There’s a picture on my blog (here, you need to scroll down a bit). The original recipe calls for lingonberry jam at the bottom of the souffle (it’s the play of tart berries and sweet meringue that makes it taste so special). Pretty authentic looking alright. And a snap to prepare with all the step-by-step pictures!